PLEASE NOTE: this “survival guide” is focused on getting you on the park’s most popular coasters and flat rides during your visit. We have left out the water park and shows in favorof seeing rides such as Gold Striker and Psycho Mouse while their lines are short. If the water park is a priority for you, we recommend hitting it up right when it opens to enjoy short slide lines. 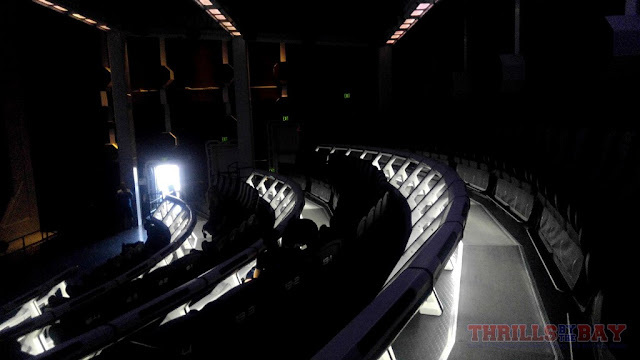 Shows are best saved for the mid to late afternoon when crowds and heat are at their highest. Finally, this guide does NOT apply to riding rides during Halloween Haunt. Crowd patterns are different during Haunt and therefore this guide will not be as helpful to you during that time. Our goal is for you to have a fun and memorable day at the park, filled with plenty of thrills and less time waiting in line. 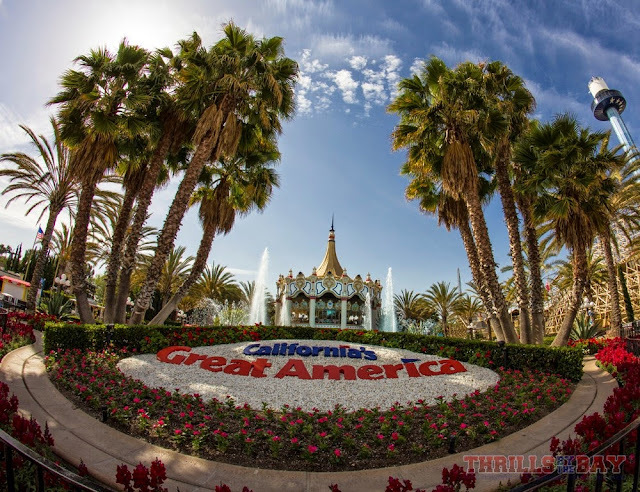 California's Great America is an easy park to navigate as the park is essentially a large circular path unlike Six Flags Siscovery Kingdom which has multiple branching paths and dead ends. We advise making use of the park's circular layout to get the most of your day. Plan to arrive at the park at least 20-30 minutes before opening. This should give you plenty of time to find parking, make your way to the front gate, and get through security. On select days, the park may start letting guests enter slightly before official opening time. 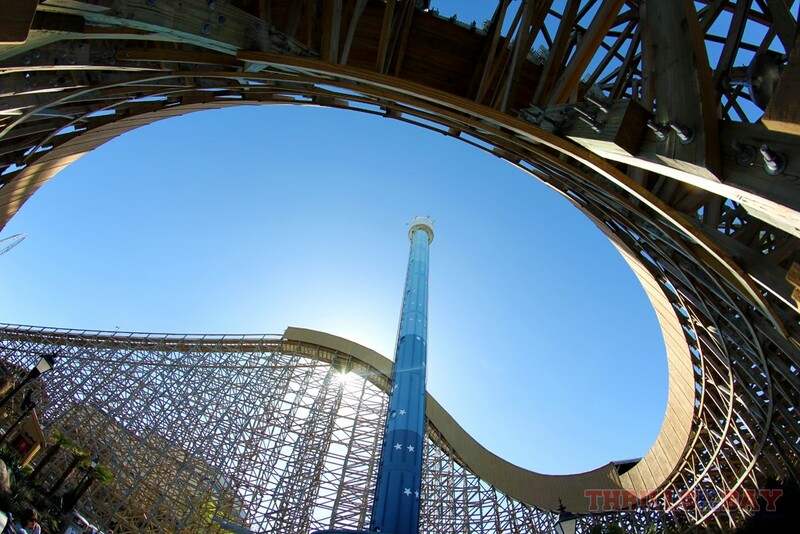 Many guests will be lining up, waiting for the park’s star attraction, Gold Striker, to open. We recommend joining the crowd and make Gold Striker your first stop of the day. As the most popular coaster at CGA, the line builds quickly and stays long throughout the day! Also, the queue for this coaster has almost no shade, so don’t let yourself bake in the sun! Ride this one early in the day or in the early evening/night time. After you’ve experienced the rush of striking gold, head across Celebration Plaza and you’ll be taking a bit of a walk to your next destination. Walk through Orleans Place past the bumper cars, past Flight Deck and through All American Corners. Across the covered bridge you’ll find yourself in front of Mass Effect: New Earth, the park’s new for 2016 motion simulator attraction. Although quite enjoyable, it is a slow loading attraction and you may find yourself standing in one spot for a long time. The queue also has very little shade and can be quite brutal in the blistering sun. The park has recently added some large umbrellas that provide some relief, but there are still spots in which you may find yourself baking. 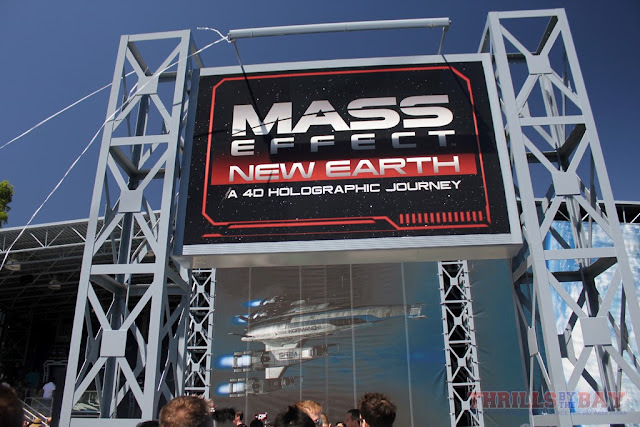 Mass Effect is best enjoyed first thing in the morning or in the late afternoon/early evening when the sun has started going down. Located quite conveniently next to Mass Effect is the giant spinning and swinging claw: Delirium! 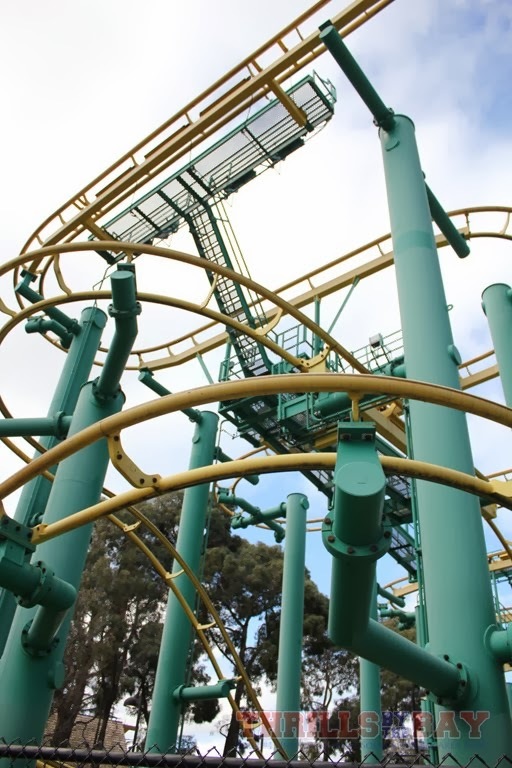 This is one of the most intense and exhilarating rides CGA has to offer. 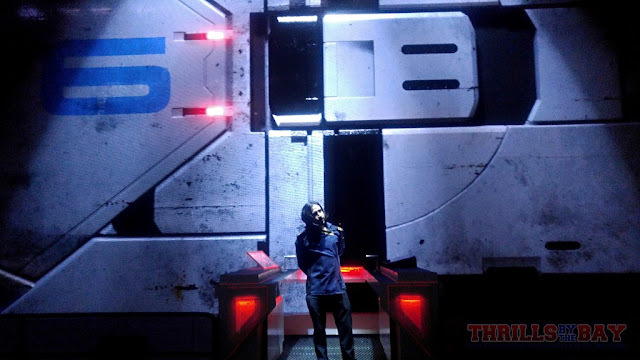 However, its fatal flaw is its restraint system, which is very sensitive and does not fit guests with greater physical dimensions. This fact means that ride operators turn away at least one guest on almost every single cycle. This slows down their operations immensely and, combined with the fact that the ride is very popular, makes the queue painfully long during the day. However, you should be able to ride with little to no wait before 11 AM. After taking a spin on Delirium, make your way to Action Zone, the back area of the park, and you’ll find that it is virtually empty! It takes guests a while to arrive in Action Zone, so we recommend taking advantage of the multiple major attractions located here while their lines are virtually nonexistent! When you first arrive in Action Zone, immediately queue up for Psycho Mouse. The park’s premiere family coaster packs a serious punch! It’s small but mighty! However, the ride vehicles which resemble colorful rodents only fit 4 riders per cycle. Psycho Mouse’s line builds very quickly and moves very slowly. Arrive at this ride before 11 AM and you’ll be able to ride with a fairly short wait. Next up is Tiki Twirl, another immensely popular ride. 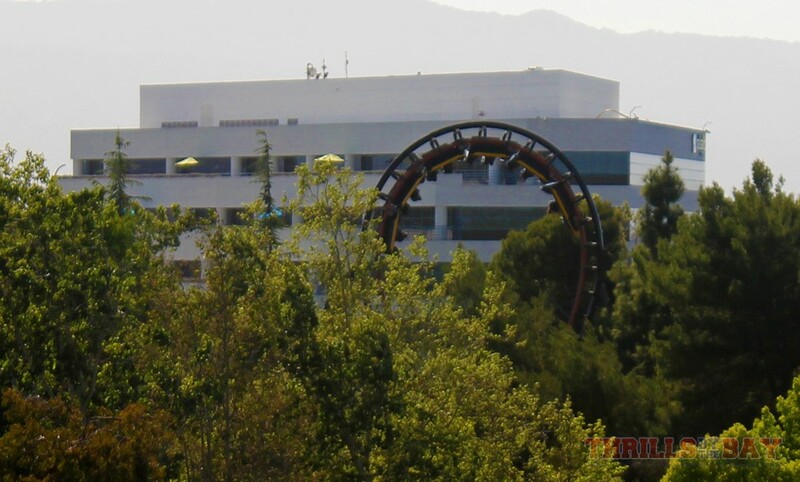 This unique attraction takes up to 40 guests on a giant disc that spins and rolls along a wavy track. The line for this one starts to build in the early afternoon so be sure to ride this one early in the day. Don't be alarmed if Tiki Twirl is down as it's common for this to happen. 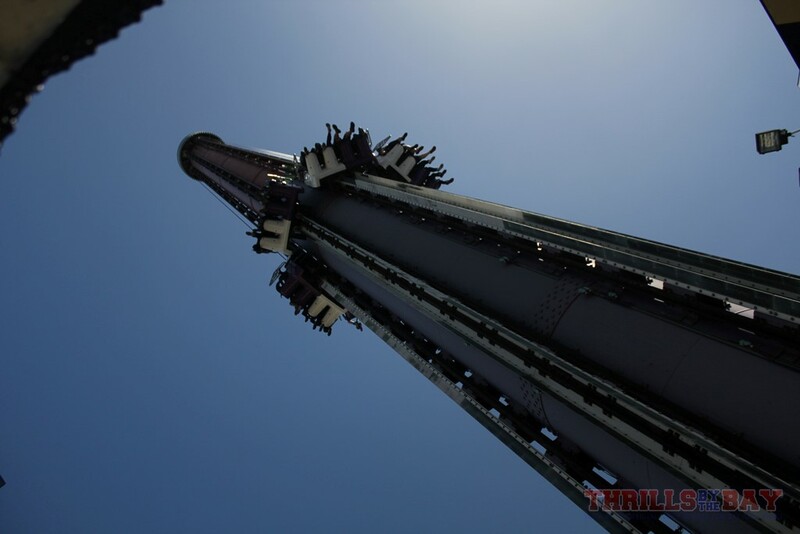 Turn your attention toward the sky and you’ll see Drop Tower, one of the most intimidating rides at CGA. If you are brave enough to take the 22 story plunge, then do it early in the day as the queue is typically longest in the early to mid afternoon. Also located in the Action Zone is Grizzly, the park’s older of the two wooden coasters. Grizzly opens at 11 AM or 12 PM on most days, meaning the line builds quickly as guests have already arrived in that area of the park. The ride’s trains have a very convoluted restraint system which includes individual seat belts for each rider, a joint lap bar (two lap bars that come down simultaneously in two separate rows), and an additional seat belt that latches into the joint lap bar. This strange restraint system causes confusion for many guests and makes for a painfully slow loading process. These factors, along with the fact that Grizzly is not the most dynamic or thrilling coaster in the park, mean that you may find it’s not worth your time. However, if riding Grizzly is a priority to you, be sure to check what time the ride opens and line up before then to ensure you can ride quickly. As you continue the loop around the park, you’ll arrive in the County Fair section of the park. Here, you’ll find Food Festival, the park’s central food court with pretty good eats for lunch and dinner. Right across from there is another star attraction that you’ll want to ride before eating: The Demon. The park’s oldest roller coaster is still quite popular and, depending on the crowds, the line for Demon can be fairly hit or miss. However, the line does move fairly quickly as it runs two trains each carrying 24 passengers. If the line is exceedingly long, try checking back in the early to mid evening. Finally, make your way back to Orleans Place to enjoy the park’s most iconic coaster: Flight Deck. This is the park’s other headlining coaster, and the line builds quickly. However, its line does move quickly as it runs two trains with 28 passengers per train. We recommend checking this one out no matter what time of day it is. If the line extends all the way to the ride’s entrance, expect about a 45-50 minute wait (may be shorter or longer depending on dispatch times). Do not miss this one! Depending on how much time it has taken you to enjoy all these superb thrill rides, you may find yourself with a lot of time left in your day at the park! Depending on your personal preference, then it’s up to you how you spend the rest of your day. Will you soak up the sun in Boomerang Bay? Will you grab some lunch at Food Festival or Maggie Browns? There are still plenty of rides that we left out of the guide such as Centrifuge, Orbit, and Flying Eagles. There is quite a bit of fun still to be had at California’s Great America even after you have ridden all the “big rides”. 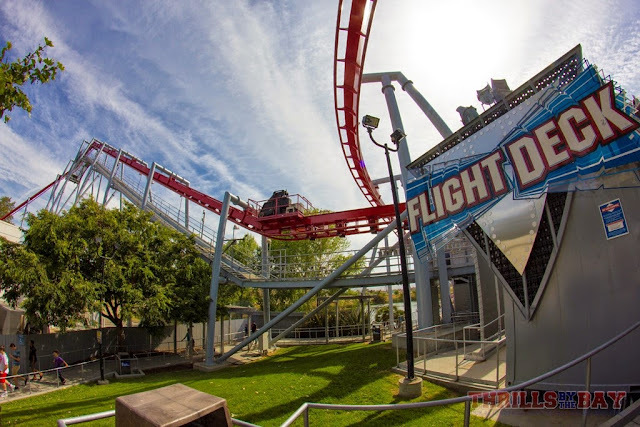 Great America also features a transportation type ride that can zip you from the front to the back of the park on the Delta Flyer/Eagle's Flight gondola attraction. Or if you want to just get off your feet for a bit and catch some cool views of the park, ask for a round trip (which will take you both directions while remaining in your gondola). We invite you to explore the park and see what parts you like best. Now get out there and have the best day ever!